Classic musettes, the road racer's "feed bag," precisely reproduced from a 1960s Italian musette in fine cotton muslin by our Los Angeles partner, to our exacting specifications. WHAT'S NEW? Let us design a custom musette for you. These musettes are perfect for short day rides, runs to the store or post office, or any other ride where all you might need is a wallet, a windbreaker, and a place to put any goodies you might pick up! Wonderful for walking & hiking too. Watch out that the fashionista in your life doesn't appropriate it for the runways! The bleached, light-weight cotton musette measures 10 x 14.5 inches, with a 40 inch-long cotton shoulder strap and a chrome button snap; all reproduced from an original 1960s Italian cycling musette and made for you when you order. Domestic Shipping: We ship by the cheapest and most secure method and any overpayment for shipping is refunded back to you after you place your order. Musettes will be shipped in a USPS flat rate Priority envelope ($7.35); up to thirty musettes will fit in the Priority envelope. Foreign Shipping: Shipping will be calculated AFTER you place your order and you will be contacted by email with the amount owed. We ship by the cheapest and most secure method and any overpayment for shipping is refunded back to you. A single musette will be shipped by International First Class ($14.25). Up to thirty musettes will fit in a USPS International Flat-Rate Priority envelope ($25.85 to Canada and $34.65 World Wide). 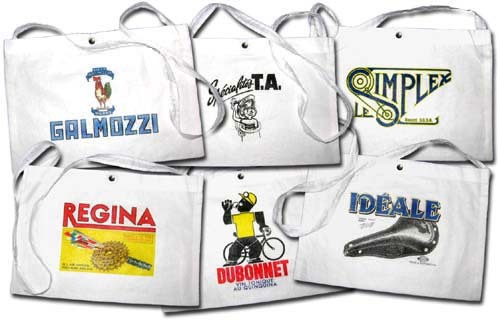 Custom Musettes: If you have an idea, photo or drawing you'd like to put on a musette we can make your musette for the same price as our regular musettes. We'd be happy to answer any questions you have; feel free to contact us.